Quinn spent several years playing on the Irish team with McLoughlin. THE TEXT BELOW is an edited version of a speech given by Niall Quinn at the launch of Alan McLoughlin’s book, A Different Shade of Green, in Dubray Books on Grafton Street last night. For more info on the book, click here. But lo and behold, Jack [Charlton] made a decision to bring Alan. He’d always want to bring Alan but the playoffs prevented that from happening — he was involved in the playoffs at Swindon. So Gary, who we all felt sorry for, went home, and we wondered how this guy would handle that situation. Would he be ‘Billy Big-Time’ and come in and say I’ve seen off that Gary Waddock? Alan might not remember this — and he has a hell of a memory — but he made a point of speaking to all of us individually and said ‘look, I know you guys knew Gary well, but I’m here now and I’ll give everything for this team.’ It was an amazing thing to say, Alan, and straight away, you knew he was a man who was very proud and who got himself there because of his ability. It was his rightful place. Circumstances meant it was a late arrival and he went on, as it says in his book, to “justify his existence,” as Jack Charlton said about him years later [see below]. But he did more than score a goal against Northern Ireland, he was an integral part of the team. For team success, you rely on your dressing room and you rely on players, and while Jack was a great leader, he was a bit scatty, and sometimes, it was the way we responded to that, and we didn’t look down on that, we laughed at it and moved on. But within your dressing room, you need characters, and there are different kinds of characters. Me? I thought the world was perfect. I’d say ‘don’t worry lads, we lost, we’ll win again next week’. Others would kick bottles over and give out, and be strong and vociferous. Alan was a real gem in the dressing room. At times, we used to call him ‘Albert Tatlock’ from Coronation Street, because there’d be a few moans going on [laughs]. But when it was right to celebrate and enjoy the games, Alan was there in the thick of it. There’s a lovely line in the book where we had a night out and things were going well in the team and years later, Alan’s great friend Roy Keane said ‘things under Jack were a shambles’. Alan mentions in the book about that time when everyone was flying and Roy took part in it, and there’s a lovely line where you say ‘he didn’t think it was a shambles that night’. That sums up where we were as an Irish team. Years later, it was very easy to knock what we did, but it was something special and magical. It was like a club and like many clubs, when you got in the Irish team, as Cascarino famously said, it was even harder to get out of it [laughs]. He played until he was about 38. But you were in a very privileged position to be in that club. You had guys that would go the final yard and do things extraordinarily well for you. This book is a fantastic book, it has so much meaning, it’s a football book with a difference. It’s not trying to go out there and shock, but it stops you in your tracks. And I know why that’s happened, it’s because Alan stopped us in our tracks at times. As mentioned in the book, there are people who didn’t contact Alan when he had cancer, and I was one of those people. He was right to question why people like me didn’t do it — we were off busy with our lives. So that’s why I came to launch the book Alan, it’s payback time [laughs]. But you make a huge point, because while we’re all on this road, and we play in the Irish team, and then retire and do things — some go into lonely places, some like me go into TV and look as though the world is going well, but one thing about that club is we haven’t all stayed in touch as well as we should have. We meet up and think it’s great but don’t have anyone like Alan, who actually points out why we should be in touch. It’s more than just football now. The last couple of chapters in this book tell you a story about a man whose bad luck in health is treated so inspirationally for someone like myself, who hasn’t had serious illness, though I’ve had it close to me in my family. What this book has done is made me think about how I’d react if I got bad news about my health. Whatever about the book, I want to commend Alan for breaking taboos and barriers down in an instant, and showing people out there that you kept working hard and you kept the spirits up through the most tumultuous time. You read about his friend who’s going through the same thing and who wasn’t so successful at the end of it. You’re an inspiration, Alan. I called you ‘Albert Tatlock’ there, but every team needs an Albert Tatlock. There’s a few fellas mentioned, where if they said ‘Quinny, I want you to launch my book,’ I’d run a mile. Jason McAteer in particular [laughs], because God knows what he’d put in it. But you and [ghostwriter] Bryce Evans have put something together that’s brought me back to a time and I’ve asked myself more questions than I’ve ever asked in my life and that’s about the best thing I can say to you. You’ve made us think again, and made me think again. Email “Niall Quinn gave a brilliant, heartfelt speech about ex-Ireland teammate Alan McLoughlin last night”. 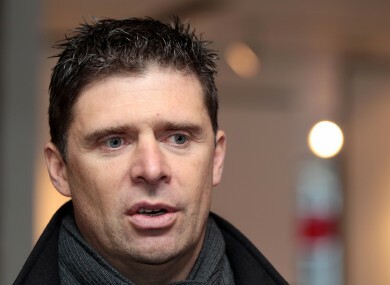 Feedback on “Niall Quinn gave a brilliant, heartfelt speech about ex-Ireland teammate Alan McLoughlin last night”.